The Islanders were coming off of a 4 game winning streak, and the Flyers were unbeaten at home. Obviously, something had to give. Unfortunately, the Isles winning streak ultimately ended. The Islanders lost to the Flyers 3-2 in a very tough game. Rick DiPietro played so-so in my opinion, but I felt the first 2 goals were not his fault. The first was off a give away in front of the net by Ruslan Fedotenko, while the 2nd was a breakaway where Bruno Gervais fell and lost his balance, leaving Scottie Upshall alone for the breakaway. The Isles had come back 2 times down by one goal off of goals by Mike Sillinger and Chris Simon. Overall, I felt the Islanders had come out strong. However, the powerplay did not look very good at all. Marc-Andre Bergeron has been good filling in for Bryan Berard, but he had a bad game last night. It was his turnover that lead to the shorthanded goal by Mike Richards half way through the 3rd period. The Islanders play the Penguins Thursday night in Pittsburgh. That should be an interesting one as the Isles look to rebound. It will be tough, but I think if they come out with a good effort and tighten up the defense a bit more then they should be OK. The Islanders finished the week by going 2-0 with wins against the Rangers and the Devils. The team is playing really good hockey right now and all is well in Islander country. The win against the Rangers was the 2nd time in a row that the team rallied from behind. Against the Rangers, they came back from 1 goal down 2 times before Miro Satan scored the game winner. Against the Devils, the Islanders came out hard and played what I thought was an excellent game. A great effort in front of the net helped Josef Vasicek score to make it 1-0 Isles. The team came out a bit slow in the 3rd period, but got some life back when they had a 5 on 3, which Satan converted on for his 3rd straight GWG. In both games, Rick DiPietro played very well and stood tall. He looks like he is getting stronger with each game and I think this will be the year where he finally makes jaws drop all season. Also, the Islanders re-acquired defenseman Freddy Meyer yesterday by picking him up off re-entry waivers. The Coyotes were trying to call him up but the Islanders reclaimed him at half his salary. Freddy is now down in Bridgeport. All in all, it was a great week for the Isles as their homestand came to an end. They now go on a 4 game road trip, all against the other 4 teams in the Atlantic division. The Atlantic is the toughest, and the Isles were not supposed to compete with them. But as things stand right now, the team has 18 points in 13 games and is 5-1 against the division. Good stuff. NYI FYI ON AIR TONIGHT AT 10 PM: Sean and I will be on air tonight at 10 PM on www.mywcwp.com. As always, we'll be taking calls and IM's through AIM. For those unable to listen live, we'll have a podcast of the show up at www.nyifyi.mypodcast.com. Hope to hear from many fans tonight! Islanders fans, give yourselves a pat on the back! Thank you for supporting this team, and showing them how much they mean to us. The Sports Business Journal reports that the New York Islanders have had a 34% increase in attendance this season. That is the HIGHEST IN THE NATIONAL HOCKEY LEAGUE! Keep it up! Let's rally this team from start to finish, and show them that we are with them. You know why? Because We're All Islanders! PS- Sorry for my lack of posting. Things have been crazy. As all of you know, NYI FYI is a smash on WCWP, so a lot of my time has gone towards that and the podcasts. Thanks for your support. Down 2-0 going into the 3rd, it seemed unthinkable to me that the team would lose on Al Arbour night. However, it did seem possible against one of the most talented teams in the Eastern Conference. But just like the slogan said in the old days when Arbour used to coach, the outcome was never in doubt. The Islanders fought back hard, and ultimately Miro Satan scored the winner with two and a half minutes to go in the 3rd. The Islanders had scored 3 unanswered goals against the Penguins in the 3rd to win the game. It was a vintage Al Arbour game as well- a strong come from behind effort, and handing a loss to the Penguins as they were very familiar with back in Al's prime days. The ceremony after was outstanding. being in the stands, I can easily say it was the greatest thing I have ever witnessed in the NVMC yet. As a 20 year old fan, I haven't been able to witness very much yet. But this was one of the best times I ever had at a sporting event. It is something I will remember for the rest of my life. 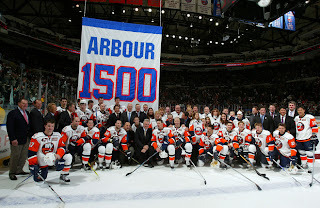 I know many fans were hoping for a 740 banner to be raised, but the isles raised a 1500 one instead. Rumor has it there are plans to raise a 740 banner later in the year, maybe on an upcoming alumni night. Other than all the festivities for Arbour is the fact that the team went down 2-0 to one of the powerhouses in the east and still managed to fight back to win. The team did an excellent job containing Sidney Crosby and Evgeni Malkin. Satan played the hero part, getting the tying and winning goals. The GTG was on a vintage Miro wrister off of a very nice pass from Josef Vasicek, something that he hadn't found in the first month of the season. The second and GWG was a second effort off of a rebound by Marc-Andre Fleury and Miro was there to bang it home. The crowd was very loud, the atmosphere intense. It felt like a playoff game in there. The players wanted it for Al, as did the fans. A great job all around for the Isles. Enough can't be said about Ted Nolan in all of this. It was ultimately his decision, and he ran it by Garth Snow and Charles Wang. After approval, they invited Arbour to come back and coach for one game. It really shows how much Nolan respects the Isles for giving him his second chance in the NHL, and also speaks volumes to how much he respects the Islanders roots. Nolan had a very tough job ahead of him at the beginning of last season, and that was to begin a culture change on Long Island. After seeing Ted as coach for 1 season and 1 month, I can honestly say I have seen more amazing things that I have seen in any of the previous seasons as an Islander fan. Things like this get recognition around the league, as can be seen from the many positive articles being published about the team today. Great job all around, especially by Ted Nolan. He is a keeper. Oh, and by the way, the Islanders are second in the division with a record of 7-4-0. Not to shabby for a team the was predicted by "experts" to be at the bottom of the league, don't ya think? On a more serious note, Rick DiPietro took a Crosby stick to the eye in the 2nd period and did not return. His eye is OK though, and he will get looked at again on Monday. Right now his status for Tuesdays game against the Rangers is unknown. We'll keep you updated as always. NYI FYI ON THE AIR TONIGHT: Sean and I will be on the air tonight at 10 PM on http://www.mywcwp.com/. We'll be taking calls and IM's and are asking fans who listen to call in or IM to share their favorite Arbour Memories from over the years. We have a nice show planned tonight, and the 2-0 week makes it much easier. After the show we will be putting up the podcast which will be available at the link on the side of this page titled "NYI FYI Podcasts." Enjoy! Isles beat Lightning 4-0; Al Arbour Night Tonight! On Thursday, the Islanders defeated the Tampa Bay Lightning 4-0. Bill Guerin, Josef Vasicek, Ruslan Fedotenko and Trent Hunter all scored for the Isles. Rick DiPietro came up huge and bailed the team out on a couple of occasions to get the shut out. The team played a much better game then they did the previous Saturday against the Carolina Hurricanes. They came out a bit slow in the first period, but by the end of the period they began to play like we all know they can. That carried over into the 2nd and 3rd periods. Team defense overall was very good. Chris Campoli had 4 blocked shots. he has really come around this year and looks like he has improved on his rookie form of 2 years ago. Very excited to see him develop even more over the next few years. All 4 Islander goals were scored at even strength, which is good to see being that the team had struggled with 5 on 5 play so far this year. The absence of Bryan Berard has been noticeable, especially on the power play. But he has been skating in practice and could return on another week or two. Tonight is a very special night in Islanders country as Al Arbour returns to coach the team for 1 game. Radar will be coaching in his 1500th game for the team when the puck drops at 7 PM against Sidney Crosby and the Pittsburgh Penguins. I am going to the game and cannot wait! Hopefully the team helps Arbour get his 740th win as a coach. With big events like this, the team has played well over the last few seasons. Being that this is a big event, I would expect your typical blue collar Islander effort. The Penguins are a very tough team to beat, but the team could very well pull it off. We shall see. Absent tonight from the lineup is Sean Bergenheim. Ted Nolan said Bergie is sore, and now reports say it's his shoulder that is giving him some problems. Right now it looks like it's a day-to-day thing, but at least for tonight, Bergie is out and Ben Walter is in. The team called him up from Bridgeport this morning and it looks like he will make his Islander debut tonight. Good luck to him on that, I'll try and take notice of him while at the game. Sean will also be at the game. We could be more excited for this one. Should be a packed house and a playoff atmosphere!